One-stop upgrade for your Windows tablet, laptop, or desktop. Connect up to 10 accessories through a single USB cable. Includes the latest drivers and firmware for compatibility with Windows 10 and earlier. Fully backward compatible with USB 2.0 PCs and devices. 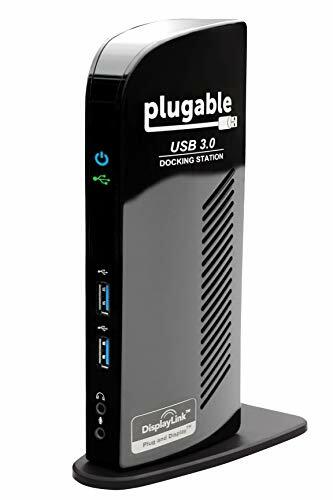 Features two graphics ports: an HDMI port and a DVI-I port with VGA adapter for mirroring/extending your Windows desktop to external monitors, a Gigabit Ethernet port (10/100/1000 supported, full-duplex required), audio input/output, two USB 3.0 ports, and four USB 2.0 ports. Windows 10, 8.1, 8, and 7 drivers can be automatically installed by Windows Update (with an existing Internet connection) or can be downloaded from Plugable.com/drivers. Requires Intel / AMD / NVIDIA main GPU and driver. USB graphics require dual-core 2GHz+ CPU for best performance.Up-to-date USB drivers on host system recommended. DVI dual-link connection not supported. 2560x1440 (1440P) resolution only available with native HDMI monitor. 1440P not supported when using HDMI-to-DVI adapter/cable or DVI monitor. Cannot be mixed with non-DisplayLink USB graphics adapters and drivers (e.g. MCT, j5, or SMSC). HDCP/Blu-ray playback not supported. Not recommended for gaming. Mac OS X, ARM-based versions of Windows (Surface RT) and Linux/Unix are not supported. Includes robust 20W UL certified power supply for supporting several devices requiring USB 3.0's more demanding 900mA per-port power. Does not provide power to attached computer.